Plenty of controller keyboards have been given to the world by M-Audio over the years, but the Venom is their first actual synth. A 12-voice virtual analogue doubling as a USB 2 audio and MIDI interface, it takes samples of classic synths and drum machines, rather than using modelled oscillators, and subjects them to waveshaping, oscillator sync and FM. It's bundled with a slick PC/Mac editor, which is needed to make original patches, but for performance tweaking, a matrix of buttons and encoders bring the most often‑needed parameters to the front panel. The Venom's vivid green display is in stark contrast to the unthreatening white plastic in which it sits. Being light and compact, it shouldn't give anyone backache but what it might do to your eyes is another matter. The panel text is rather indistinct in low-light conditions, especially those parts that are grey on grey, or orange on grey. And for further eye‑strain potential, the display's spindly text isn't the most readable either, but with detailed editing entirely in the realm of software, this isn't a major disadvantage. Playing a few keys, I found the action to be light and pleasantly springy. The keyboard spans four octaves and is velocity sensitive but lacking in aftertouch. The controls are sparse but logically arranged, with a cluster of volume knobs in the top-left corner that include separate gain controls for the mic and instrument inputs, each with level and clipping indicators. Curiously, M‑Audio have found room for a mono button, which is hardly a common feature even when controls are plentiful. The rest of the panel features pretty standard stuff: arpeggiator and tap-tempo controls, octave-transpose buttons, a mod wheel and pitch-bender plus a front‑loading headphone socket. Moving into the 'tweak zone', the Performance Controls are of greater interest; they consist of a matrix of six rows of options, four continuous encoders and a button. The encoders aren't the most rugged of their species but they perform well for rapid adjustments of the filter, envelopes, LFOs and a fair selection of other parameters. Rounding off our initial scan, a rearward glance reveals nothing to baffle seasoned Sound On Sound readers. The single pair of audio outputs is a trifle disappointing; an extra pair would have allowed the synth and audio interface to be easily separated, or the four parts to be divided for individual effect treatments. Inputs are better catered for: there's a stereo auxiliary input — on RCA connectors — plus an instrument and mic input, both on quarter‑inch jacks. These four are internally merged to a single stereo stream, and there's also a USB 2 port keen to carry both audio and MIDI. You won't find an XLR input, phantom power or digital I/O, the remaining connections being sustain and expression pedal inputs, MIDI In and Out (but no Thru) and a 9V DC input. The supplied adaptor is small and the review model's ran fairly warm, but it is necessary because the Venom can't be powered from USB. The Venom's rear panel features a pair of quarter‑inch audio outputs, stereo RCA audio inputs, quarter‑inch instrument and mic inputs, sockets for an expression and a sustain pedal, MIDI I/O ports, a USB 2 port and a socket for the external power supply. 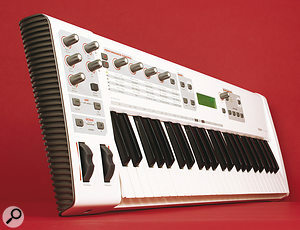 The headphone output is at the front of the synth. The Venom has 512 single patches arranged in four banks (A‑D), the first two being fixed in ROM. Unusually, given the fairly unspectacular polyphony of 12 notes, up to four patches can be stacked or split into their own keyboard regions, and the results stored in 256 Multi patches. As these merely contain pointers to the single memory banks, this can be an issue when you edit a patch that might appear in lots of Multis. The Venom powers up in Multi mode, its selector button allocating roles to the four 'part' buttons. These assign parts to be edited, muted or entirely disabled which, unlike muting, frees up polyphony. Without a category search facility, the gently notched Value encoder is your sole means of patch selection. A Bank button is on hand to step through banks of patches, arpeggio patterns and multis. Spinning through, I started to realise why the advertising blurb was so keen on the words 'danger', 'aggressive', 'angry' and 'nasty'. Many of the (primarily dance‑oriented) factory patches seem to demand: 'are you lookin' at me?'. The impression isn't of a lush and creamy analogue wannabe but of a yapping upstart intent on spitting in your face — or biting off your ear. Hard‑edged basses, gnarly leads and brash sound effects assault you from every angle. There are a few softer pads, electric pianos and gentler tones, although the reverb featured in many of them has a ringing, metallic quality that I found quite grating. The front panel is a sparse affair, featuring only controls for the audio interface and four endless rotary encoders to control synth parameters. All the real action happens in the Vyzex software editor. Psicraft's Vyzex is required to bring the dozens of otherwise inaccessible parameters to the screen of your PC or Mac. Having browsed the CD, I saw that newer versions of the driver and editor were already online, so I put it aside and downloaded them instead! Having installed the USB drivers and then the editor itself, I couldn't immediately persuade the auto‑detect routines to find the synth. Eventually, I performed a hard reset, which did the trick; afterwards editor and synth chatted like old buddies. Vyzex is the only way to go deeper than a bit of filter or envelope fiddling, so I'm glad to report that it supplies practically everything you need, plus a glut of functionality just for kicks and giggles. The layout is universally clear and welcoming, the graphics unfussy. Once you become used to clicking the small boxes (OSC, LFO, MOD, AUX) to select and expand the various sections, you're flying. At the top left‑hand corner is the Mode drop‑down menu, where you can create a new Multi, edit a part in a Multi or a single program, and so on. I found Multi editing to be a breeze, whether performing simple tasks like setting each part's key or velocity zones, or merely assigning independent MIDI channels for external sequencing. Similarly, the listing of all oscillator and LFO waveforms gave me an instant appreciation of what I had to play with. Perhaps my favourite Vyzex component is the 'patch collider', a sophisticated tool for generating random patches. This is achieved by mixing elements from a range of others, creating morphed patch transitions or similar outlandish techniques. Many of the resulting patches were more fun than those that spawned them, which was an unexpected bonus! As space is at a premium next to my computer, I hoped to pass note data through Vyzex from my master keyboard while editing, but according to the helpful chaps on the Psicraft forum, this isn't possible. You can, at least, remote‑control Vyzex parameters, albeit indirectly, by assigning your control surface to transmit the supported MIDI CCs. This isn't ideal if you're used to MIDI Learn‑type operations, but is a worthwhile mouse‑limitation compromise. Alternatively, touch a control on the synth and the editor keeps in step, opening new pages whenever necessary. Before heading off to explore, I should point out that Vyzex is a stand‑alone editor. It does not work as a VST/AU plug‑in, although this functionality is planned at a later date (for a fee of about $20). 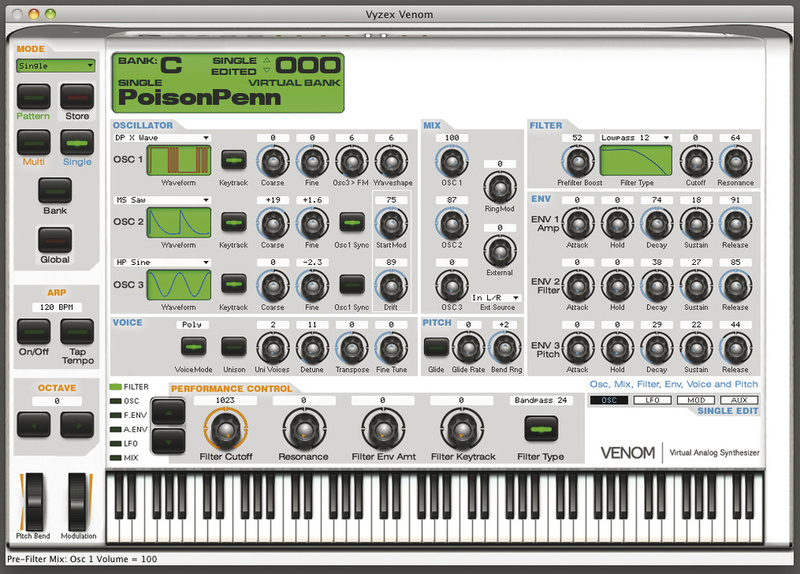 The Vyzex software editor reveals the Venom's inner workings and offers a number of different screens to help you get the most out of its synthesis engine. With 94 waveforms derived from analogue synths, digital synths and drum machines, you have a fridge full of ingredients to create classic or contemporary treats. Amongst the sines, saws and pulse waves (prefixed by SH, MG, OB, JX, and so on, to suggest their origins) you'll also find FM and sync waves, white noise, four multisampled drum kits (including an '08 Kit' and '09 Kit') and various single percussion hits. Of the Venom's three oscillators, the first is the biggie, having several important advantages over the others. Firstly, it has waveshaping — an interesting prospect, given that these are sample‑based oscillators. When enabled, waveshaping can be applied to any waveform, the shape set manually or modulated from within the mod matrix. The results aren't always similar to the equivalent shape-modulation of modelled oscillators; waveshaping Venom‑style has its own unique and often dirty character. Oscillator 1 may also be frequency-modulated by oscillator 3, and this is another source of sharp, occasionally vicious tones. Used tastefully, the FM implementation can stray into territory once ruled by Yamaha's DX synths — but feed it any waveform other than sine and prepare to experience a rush of scary harmonics. The first oscillator serves as sync master for the other two, and although it never really approaches classic analogue hard sync, it's in keeping with the brash and generally digital Venom. The oscillators may be loosened up slightly by applying randomness to their starting phase and pitch. Unsurprisingly, the ring modulator keeps us in 'challenging' territory. Derived from the first two oscillators, its output is mixed with the internal and external signals, the latter including the summed audio inputs or audio channelled via USB. The mix output then hits the filter via a tube‑inspired saturation stage, laying on a generous dollop of fatness. There are six filter choices — low‑, band‑ and high‑pass, 12 or 24dB — and I turned first to the 24dB low‑pass. With a fast spin of the encoder, I found its cutoff slightly steppy — which is surprising, considering the resolution of 1024 discrete values. At this resolution, you have to spin the encoder a few times for a full sweep, but if this is an issue it's easy enough to assign the modulation wheel to do the job instead. I can't say this filter particularly stood out; it felt a bit lifeless and I much preferred the generally more versatile and clean 12dB version. The high‑ and band‑pass filters are suitably clear and fizzy, and when I layered a couple of patches in Multi mode, allocating different filters to each, the Venom began to sound like a much more expensive synth. Once upon a time we were grateful to get one LFO, but three is a more common number these days. The Venom's trio have an admirable selection of common waveforms, including sample and hold, and plentiful MIDI sync options. The first two LFOs are polyphonic (ie. one per voice) and offer variable start phase, attack time and delay, while the third is simpler and monophonic, applying to all voices equally. There are three AHDSR envelopes, featuring a hold section of up to 20 seconds before decay commences. Envelope 2 is usually assigned to the filter and, although labelled 'pitch', envelope 3 is actually freely assignable to any destination in the modulation matrix. I've referred to the modulation matrix several times now and, other than the few hard‑wired connections, it is the one‑stop shop for all modulation. With 16 slots to populate as you see fit, and sources that include envelopes, LFOs, velocity, keytrack and even aftertouch (via an external keyboard), the mod matrix is your ticket from subtle to weird and all destinations in between. Sadly, none of the effects' parameters are available as modulation destinations, but the amounts of other slots within the matrix are. You can thus build complex inter‑modulation routings, which are helpfully illustrated by Vyzex, so you'll never lose track of what's what. Unison mode can, of course, gobble up those 12 notes of polyphony very quickly. It will even stack all the voices on a single note if you're feeling brave. Whether or not unison is engaged, a patch can be either poly or mono, the latter in the form of legato single triggering only. Interestingly, glide comes in two flavours: as either a rate or time value. Glide rate is dependent on the distance between two notes and glide time is absolute, irrespective of the distance. Good stuff. As I mentioned earlier, some of the factory Multis do a fine job of demonstrating the Venom's prowess. For example, Bank A018 'Solution' delivers drums, bass and a mid‑range sequence arranged across the keyboard. The drums can be faded in and out with the mod wheel, but if you select all three parts, you can apply simultaneous filtering to the lot using just the performance controls. Should you get bored of the drum pattern, pick a new one and hear it switch over without missing a beat. Sometimes it's tough to see the parts that are currently selected (note indicators flash using the same LED that indicates selection) but generally, working in Multi mode offers real creative potential, but be aware that polyphony is allocated dynamically — there's no way to reserve notes for important parts such as drums or bass. Actually, the drum patterns work really well, often going for a lo‑fi angle, which seems in keeping with the Venom's underlying philosophy. Each of the four parts has its own insert effect and EQ, plus sends to the two main (Aux) effects. The insert effects comprise EQ Bandpass, Compressor, Auto‑wah, Distortion and Reducer, and each contributes to the sense of 'attitude', adding different degrees of grit or bite. Each patch or multitimbral part has a send level connected to two Aux effects (FX1 and FX2). Of these, FX1 is either reverb or delay, with various types available, while FX2 offers flanger, chorus, phaser or a short delay. Finally, there's a master EQ placed just before the main output stage. Having already offered my impression of the reverb, all I really want to add is that I felt the effects were the Venom's weakest feature. The phaser and delay were useable enough, but personally I'd opt for an external processor wherever possible. After Avid took control of M‑Audio, it made sense to take advantage of the resident software might that is Digidesign. Thus it should be no surprise that Pro Tools (M‑Powered) features heavily in the Venom documentation, with plenty of tips included for setting them up together. I had no difficulty in applying the same principles to Logic on my Mac, the Venom slotting in neatly in its audio and MIDI capacities. Actually, there isn't a great deal to report on this front. The two‑channel interface handles 24‑bit audio without compromise and performed as my main interface throughout the review period. Its only disadvantage was the restriction to 44.1kHz — there's no 48kHz option. The two audio inputs are summed from the phono connectors and line and mic inputs; they appear as inputs 1 & 2 to a DAW. And much as I appreciated the ability to check my mixes in mono and the convenience of a direct monitoring knob, I would have dearly liked a dedicated level control for the host audio too. The Venom's MIDI interface is beautifully straightforward. Two MIDI ports are visible from within your DAW: Venom MIDI Out and Venom Synth Out. 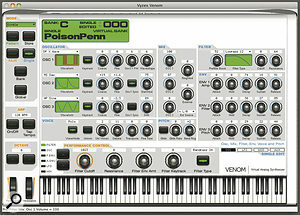 Thus you can access the synth engine and any external hardware connected to the Venom's MIDI Out socket. M‑Audio are best known for their hardware controllers and their audio interfaces, so a synth seems like the next logical step. But rather than being a typical virtual analogue aimed at string pads and Minimoog impressions, the Venom is an edgy, often unsettling instrument capable of ripping holes in mixes — and maybe your eardrums. Despite the Venom's abundant selection of waveforms, I was never fully convinced that a series of slightly different sawtooth samples represented a genuine substitute for one well‑modelled version paired with a high-quality filter. However, even though the synth engine and effects never quite tickled my taste buds, I'm sure there are many out there with a greater appetite for gritty, buzzy, dirty sounds who will welcome a keyboard so adept at producing them. I should also mention that the presence of a solidly‑implemented audio and MIDI interface adds a bonus not to be underestimated. Both Novation's Ultranova and Roland's Gaia SH01 provide more lush‑sounding alternatives, each also boasting audio interface capabilities, although not a USB MIDI interface. The Ultranova integrates into a DAW environment, and has an extra pair of audio outputs, an aftertouch‑enabled keyboard and Automap capabilities, while the SH01 has tons of polyphony and that very hands‑on panel of knobs and sliders. It did strike me as odd that, despite having the least polyphony of the three, the Venom is the only one that permits more than one of its patches to be played at once. That, plus its rather brash character and slightly lower price, could win it some friends. The Venom's arpeggiator appears simple, but is nevertheless highly effective. It can sync to MIDI and has the usual up/down motions plus phrase and drum modes, the latter resisting transposition to keep drum patterns consistent regardless of what happens on the keyboard. There's no easy access to the various modes, though; they are embedded into 256 stored patterns. To select a different pattern for any patch, you have to hit the Pattern button and choose from two banks of alternatives. I said earlier that the Vyzex editor offers practically everything that you need. One omission is pattern editing, currently marked "reserved for future expansion”. To create original arpeggio patterns, you have to seek out the Venom driver (accessible on the Mac via System Preferences) and import MIDI files previously created in a sequencer/DAW. This isn't ideal, but at least it works — and hopefully a full pattern editor will find its way into Vyzex before too long. Sound On Sound is the most influential hi-tech and recording magazine in the USA today. The publication has built its reputation on in-depth, unbiased, independent product tests that really tell it like it is, written by recording engineers, not journalists. These are accompanied by the most useful practical workshops and the best technical interviews out there. As an Avid customer, you can now subscribe to Sound On Sound at the special discount price of $39. If you are not already a reader, Avid have arranged for you to see what you've been missing, simply click on the three articles below. Enter the AVID Promotion Code AVIDUS11 in the box below.Click the ADD TO BASKET button.You will be taken directly to the Checkout to complete your purchase (credit card required). Please login before completing the instructions above and your sub will be extended by 12 issues at the agreed offer price once your existing sub expires. Offer good for all residents of the USA and Canada only. Offer applies only if you have less than 2 years (24 months) remaining on your existing subscription period. Incorporates a 24‑bit USB audio and MIDI interface. Audio interface lacks 48kHz support. Requires computer for detailed editing. M‑Audio's surprise entry into the synth market, the Venom takes samples of classic synth waveforms and encourages them to be dirty. An alternative to creamy and polished virtual analogues, the Venom also includes a USB audio and MIDI interface, plus free editing software. Company +1 626 633 9050.